When you want the best care for your business office or retail center you should call a commercial electrician. This is especially true when you need multiple AC units installed. We offer expert service at Omega Electrical & Mechanical Contractors. Not only will you get excellent customer service, but our electricians are sure to install your systems perfectly. Whether you need new units or want to switch from evaporative air to refrigerated air, we can help. The best way to maintain your air conditioner units is to call in experts for regular maintenance. When your unit gets a regular inspection, the technicians will spot any upcoming trouble. Not only that, they will lubricate parts, clean up grime, change out filters and take care of any trouble spots. 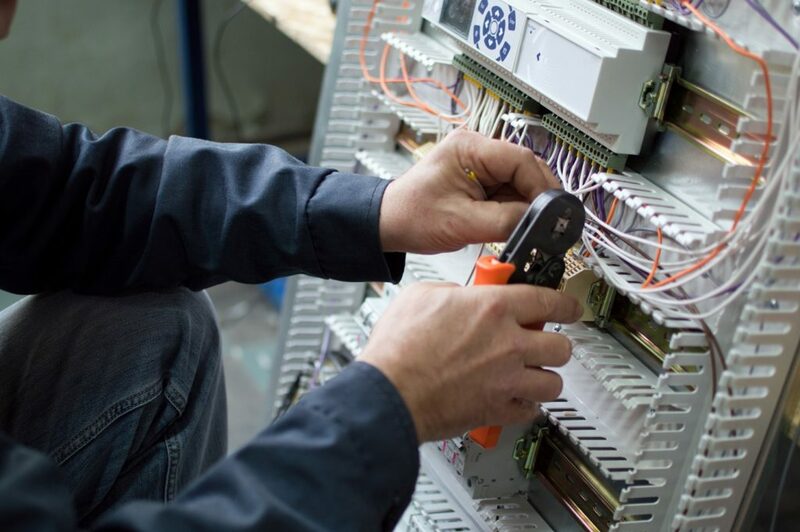 If you need repairs, a commercial electrician can take care of the problem. Taking care of repairs as quickly as possible will prolong the lifespan of your AC units. Many business owners in El Paso are changing from evaporative air to refrigerated air. This is because making the switch has a lot of benefits. Refrigerated air conditioners work no matter the weather circumstances outside. A lot of business owners complain that their offices or retail centers don’t receive cool air on humid days with swamp coolers. However, refrigerated air does not rely on outside air to cool the space. For a large location, refrigerated air can be a lot more efficient at cooling. It is as simple as setting a thermostat and then letting the system do its job. Your employees and your clients will definitely feel the difference. When it comes to getting expert service that you can depend on, a commercial electrician can take care of your needs. With more than just HVAC experience they can provide well-rounded care. Not only that, a commercial electrician is well versed at providing service for larger units and a bigger number of units for large locations. This can also be useful when your commercial location needs electrical and HVAC services. Instead of turning to several contractors, you can get all your help from one location. If you are in need of electrical or HVAC conversion, contact us today at Omega Electrical & Mechanical Contractors. Our experts provide great customer care and excellent service. Give us a call today to set up a consultation.